Premade sandwiches might seem convenient if you’re someone who routinely forgets to pack a lunch for work or school. Some of these sandwiches can run anywhere from $3 to $5. It’s much cheaper — and healthier — to pack your own sandwiches. It takes a couple of minutes to put together a quick sandwich and you won’t be paying an outrageous price for packaging. There are so many different brands of rice or pasta dishes in the supermarket, and they often seem like a nice, easy meal. You just throw the contents of the box into boiling water, wait for it to cook, and your meal or side dish is finished! However, unless these items are remarkably cheap (and they’re usually an average of $2 to $3 per box), all you’re paying for is a sauce or spice mix made from ingredients you probably already own. Instead, cook some plain rice or pasta and add your own spices. Salad kits are great if you don’t have time to make your own salad from scratch, but they’re a huge waste of money. It doesn’t take that long to make a quick salad. After all, what you’re actually paying for in a salad mix is pre-cut vegetables and fancy plastic packaging. For the price of one or two salad kits, you could make your own salad that lasts for several meals. Many supermarkets carry small packages of trail mix that are often overpriced. If you’re someone who eats trail mix regularly, you might want to think about making your own. Many of the ingredients are cheap (especially if you buy them in bulk), and you’ll be able to get more trail mix for your money. Plus, picky eaters will be able to include only the ingredients they like! One of the recent supermarket trends is posting “10 for $10” or “2 for $5” sales. These sales might seem like a great idea, but they convince some people that they need to purchase all 10 items to get the deal price (often you don’t). Of course, if you know you’re going to eat 10 boxes of pasta in a reasonable time frame, go ahead! But be wary of this deal when it comes to perishable food. There’s no need to buy 10 containers of yoghurt if they’re going to expire before you eat them. Supermarkets often include cosmetics or shampoo for people who like to buy all their groceries and toiletries in one place. However, many of these cosmetics or toiletries are significantly marked up from their counterparts in the pharmacy or discount store. Even with a coupon, you’d still be paying more. If you’re really worried about money, save that $0.50 or $1 and buy the item from the pharmacy or discount store instead. 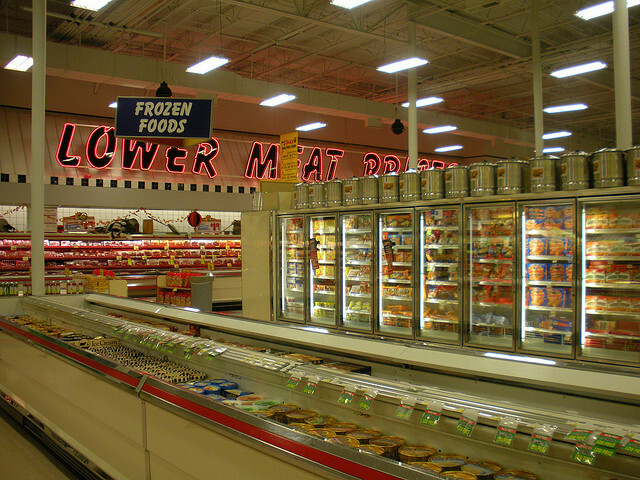 Similar to cosmetics and toiletries, some supermarkets sell kitchen utensils or cookware. While a $1 item is great in a pinch, most of the pots, pans, or utensils are grossly overpriced. The cheaper generic models will usually be made from poor quality materials, as well. If you’re looking for quality utensils or pans, buy them from a department or specialty store. Or even check out the prices online – chances are you might be able to find them cheaper there. It may sound strange, but ground coffee is typically more expensive per ounce than coffee beans (although it is even cheaper to get free coffee. Ground coffee is great for convenience, but many supermarkets have their own coffee grinders in the coffee aisle. Or, if you already own a coffee grinder, buy the cheaper bagged coffee beans and grind them when you get home. The end result is the same, but by buying the beans instead of the ground coffee, you’ll be saving a few dollars. Diapers are almost always overpriced at the supermarket. Like many other non-food or cooking products, diapers are in grocery stores for convenience. But diapers are rarely on sale in supermarkets and those coupons you’ve been clipping will be more helpful at the drugstore or Target. If you’re willing to make an extra trip – or to even buy them online – you’ll be saving a lot of money. A lot of supermarkets have been trying to include bulk items, such as five packs of salad dressing bottles, extra-large 2-in-1 cereal boxes, or gargantuan toilet paper bundles. Bulk items often seem like a great purchase, but don’t be swayed by a seemingly great deal. Most bulk items at supermarkets are more expensive than the bulk items you would actually buy at somewhere like Sam’s Club or Costco. If you’re able to make the trip to a discount store, do so and compare the prices. What other items have you found that you never buy at the grocery store due to their overly marked up price?